What’s up y’all? I don’t have too much to write because I had a phone call for the mom yesterday which was great & very enjoyable too! We had an apostle come visit us this past week for our mission conference… wait for it… Elder Jeffrey R. Holland! It was legit and he spoke a whole lot about how you shouldn’t destroy a future missionary’s ideals by your own actions/poor example, and how we cannot afford less active returned missionaries, etc. There were a lot of other things he mentioned, but those were the two points that stood out the most. We found out this past Monday (last P-day) from one of the families we are teaching that some guy was stabbed and killed while we were out running around taking care of things for the upcoming week. (There are actually a couple of gangs in our area that are affiliated with the Crips so Utah is semi ghetto, I guess). 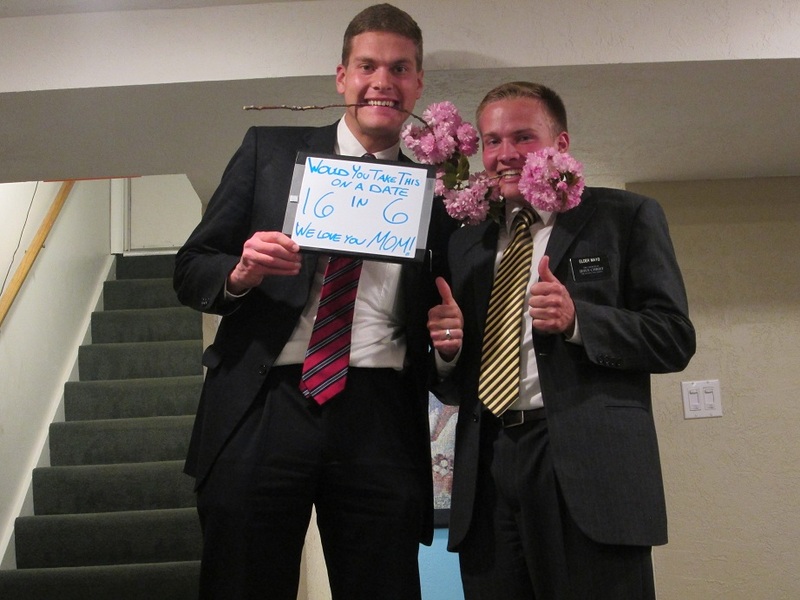 As you can see, for Mother’s Day Elder Mayo and I goofed around and took some photos to put some ladies in awe, ha ha ha. Just kidding, don’t get any ideas though because we are already taken (by the city of K-Town). Lastly, we had a baptism for a twelve year old that went extremely well. We had a priesthood holder who had never personally baptized or confirmed anyone in his entire life do it, so he was extremely clueless most of the time! He did well though and that’s all that matters. Take Care Everyone, & I will hopefully have more to talk about next week!